Candence is a well-known watch brand that makes a number of clever timepieces for decent upstanding folks but I’m afraid I’m not longer going to be able to support these jokers and their new gateway watch that is rending the fabric of American society as we speak. You see these hipsters and dipsters running around the city these days and making noise and drinking their Lokos and you just know it’s because of these potty-mouth watches! And another thing what’s with these short-haired girls you can’t even tell the difference between girls and boys anymore on the train! Everybody’s got earrings and you can’t even figure it out! This watch celebrates 4:20 which is hippy code for smoking “grass” or, as the kids call it, “reeftoke.” If you see your kids wearing this watch or using a mobile phone or watching The Daily Show, you can be almost certain they are polluting their bodies with killer drugs. The watch has a Japanese (BUY AMERICAN, MORAN!) 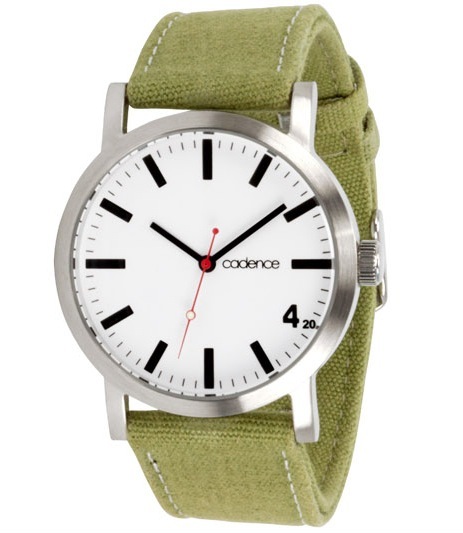 watch movement and green cotton strap (BUY LEATHER, MORAN!). It costs $85 and is available today. I’d recommend sending Cadence a sternly-worded letter because I, like you, don’t do drugs and prefer to finish a case of good old American Miller High Life of an evening to any Spanish fly or whatever these kids are tooting. Nancy Reagan, where are you today when we need you the most?